An efficient network of pipelines is an indicator of urban development. But there is more to this primary public utility than delivering freshwater to residential and commercial establishments. After all, moving water has potential for producing energy. Portland based energy technology company Lucid Energy, Inc. has designed and implemented the LucidPipe Power System for harnessing the untapped energy potential of moving water to produce clean and low-cost electricity. The LucidPipe includes lift-based, vertical axis spherical hydrodynamic turbines fitted inside large water pipes with a diameter of 24 to 94 inches. Whenever water moves inside the pipes, it drives the hydrodynamic turbines thereby generating electricity. As velocities increase, power production increases. Lucid Energy has carefully designed the hydrodynamic turbines so that they maximise power generation without affecting the quality of the flow of water. Furthermore, due to the lift-based design of the LucidPipe, it is able to generate electricity under different flow conditions, volumes, and velocities. In other words, LucidPipe generates clean and renewable electricity from excess head pressure in gravity-fed water pipelines. Photo credit: Lucid Energy, Inc.
A key feature that sets the system apart from other renewable energy technologies is that it remains unaffected by weather unlike solar energy and wind power. In addition, because turbines are enclosed inside a pipe and thereby, placed under paved streets, it has less environmental impact. A single unit of LucidPipe can produce 20 to 100 kW of electricity depending on the flow and head pressure conditions at a given site. When combined with other units, an entire system of LucidPipe can produce more than one MW of electricity. The company has designed the system to accommodate different water-related utilities. These include water transmission and distribution pipelines, wastewater effluent pipelines, industrial effluent pipelines, and thermo-electric plant waterways among others. 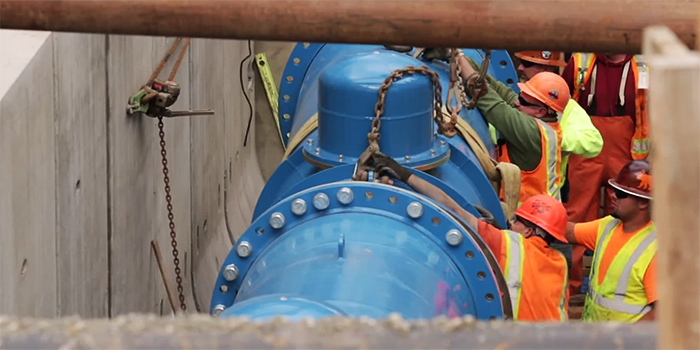 Portland, under its Conduit 3 Hydroelectric Project, has partnered with Lucid Energy to adapt and implement the LucidPipe Power System by replacing a portion of its pipeline network. The produced energy will be fed back into the city’s electrical grid. Once fully operational, the entire system can generate up to an average of 1,100 MW hours of electricity—enough to power up to 150 homes. Furthermore, electricity generate from the system will be worth $2,000,000 a year.